This article focuses on a crucial element involved in all relationships which is trust. All of us have some idea of the meaning of trust in an emotional sense, I trust my mother meaning I can rely on her or my friend is trustworthy, I can share personal information and he does not tell everyone. In psychological terms trust is believing that the person who is trusted will do what is expected, and this starts in the family and grows to others. Erik Erikson, a developmental psychologist, helped understand human behaviour by describing trust as the very first relationship building block that develops over the first two years of life. If this is successfully done by the primary caretakers of a child by being consistent, reliable and caring then security, trust and optimism develop in the child. If this is not done successfully it can lead to children feeling insecure and mistrustful making it difficult for the child to bond with family members and later in life with friends and intimate relationships. Barbara Miztal, in her book Trust in Modern Societies, points out three basic things that trust does in the lives of people. It makes social life predictable, it creates a sense of community, and it makes it easier for people to work together. As a counselling centre we are witness to the breakdown of trust in relationships, sometimes from early childhood due to a number of reasons often in circumstances outside of their control, sometimes the trust was broken in later life in an adult relationship, and at times people experience a breakdown of trust with financial situations. The Centre offers a trusting space to explore these feelings and to work through the trust being broken. 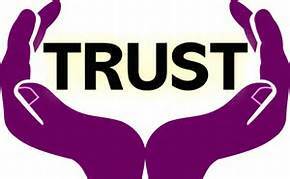 In order for a good working relationship to ensue trust is at the core of the counselling process. We ask that you trust us as a charity as well. As a Charity we are appalled by the recent revelations relating to the abuse of charitable funds and lack of governance in evidence in the high profile case currently in the media. Charities have been let down badly by the dreadful actions of a few individuals. We would like to take this opportunity to state that we strive to apply the highest standards of governance in our work, and we have committed to adopting the Governance Code for Community, Voluntary and Charitable Organisations. In addition, we publish our fully audited annual accounts and annual report on our website. We profoundly value the trust placed in us by our clients and the community.